Fun, fabulous and totally Catholic Summer Camp! Open to graduating 8th graders to graduating 12th graders! Only 10 spots! A week of crazy fun, excellent music, amazing speakers, more crazy fun, new friends for life, a renewed faith . . . a week you will remember forever! Go to http://lifeteen.com/camps/summer-camp/ for more info.! 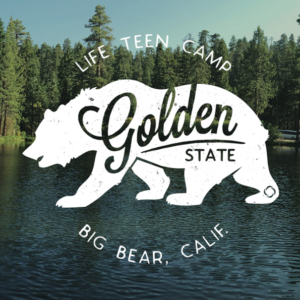 The cost of Camp Golden State is $600 for the week, and includes everything—food, lodging, transportation, and an incredible week of awesome at Big Bear Lake in southern California! TO SIGN UP, return the permission slip with a check for $200 to reserve your spot! Later payments of $200 each will be due in April and May. Download the permission slip and turn it in by March 30!